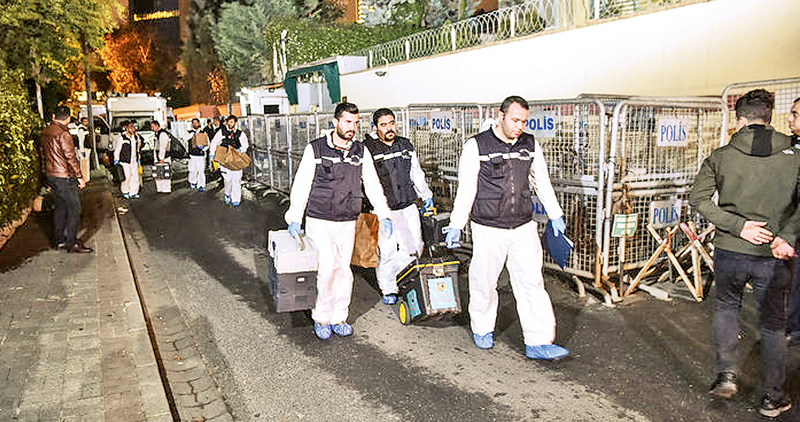 Turkish forensic police officers leave after gathering evidence at the Saudi Arabian consulate in Istanbul early on October 18. US: The US has asked Turkey for a recording said to provide strong evidence that Saudi journalist Jamal Khashoggi was killed at Istanbul’s Saudi consulate. Khashoggi has not been seen since entering the building on 2 October. Saudi Arabia denies killing him. The newspaper’s Global Opinions editor Karen Attiah said its release had been delayed in the hope that Khashoggi would return safely. Khashoggi presented a strong criticism of the state of press freedoms in the Arab world: “The Arab world is facing its own version of an Iron Curtain, imposed not by external actors but through domestic forces vying for power.